Guided tours of Lyon are a great way to discover the city and get your bearings when you arrive. You’ll be taken around all the interesting parts of the city and sightseeing is a great way to take photographs or give your legs a rest from walking. 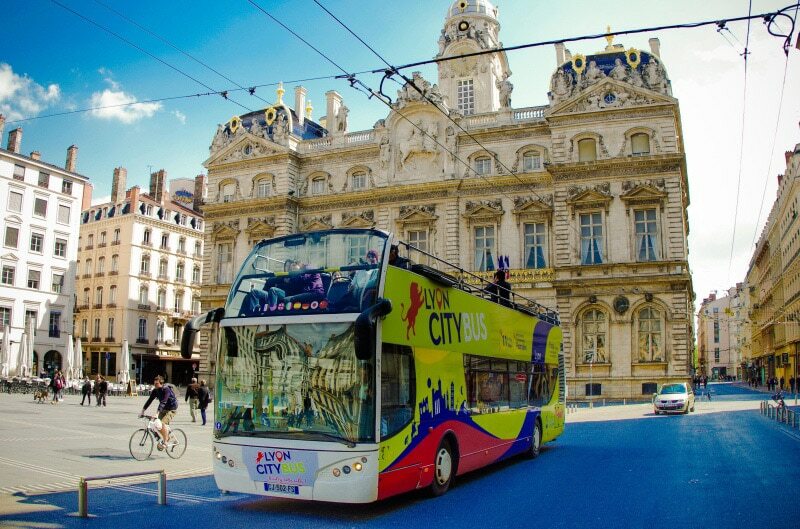 The Lyon City Bus is an open-top double decker bus and is a great way to discover Lyon. 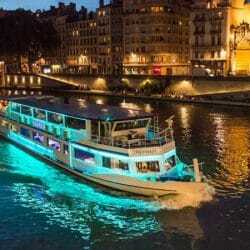 You can get off at any of the 13 different stops including Place Bellecour, Place des Jacobins, Place des Terreaux, Vieux Lyon, The Lyon Aquarium, Musée des Confluences and Fourvière and you can simply get back on the bus whenever you feel like it. Audio guides using headphones are available in several different languages including English. The full tour takes about 90 minutes and buses leave from Place Bellecour every hour. The last bus leaves at 5pm. In the summer months there is a special evening bus on Thursday and Sunday which departs Place Bellecour at 9.45pm. You can easily buy your tickets online, valid for one year and can be used whenever you like. Special rates are available for groups of 20 or more for more information email: [email protected] or phone: 04 78 56 32 42. Lyon City Tram takes visitors on a guided tour of La Croix Rousse, the hill which lies to the north of the city centre and which was the centre of European silk production in the 19th century. 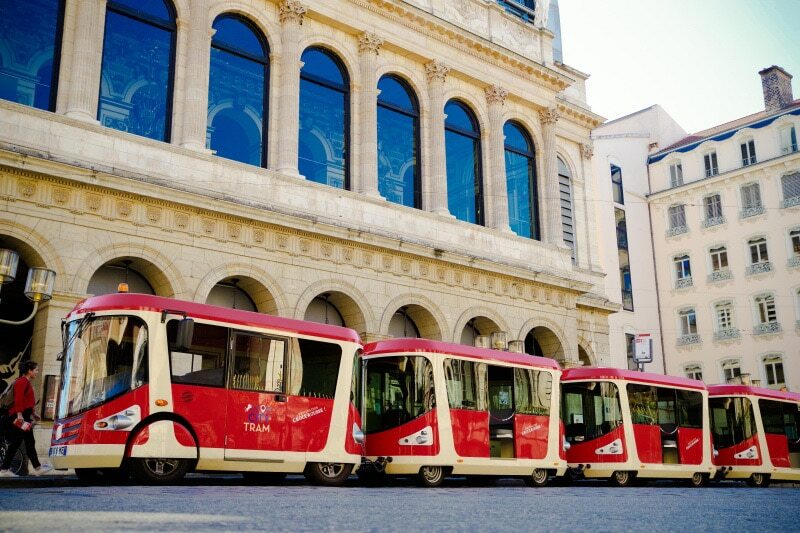 This small red train with its panoramic roof and a design reminiscent of a historic cable car is a fun way to discover an essential part of Lyon’s history and what it has to offer today. The tour takes about one hour and stops at several impressive murals including the famous “Fresque des Lyonnais” There’s an audio guide available in English, French and Spanish. Adult ticket 9€ Children €5 The tram departs from Place de La Comédie everyday at: 9.45am, 11am, 12.15pm, 2:15 pm, 3.30pm and 4.45 pm You can purchase your tickets from the website and use anytime within the year. Place de la Comédie is located in between the Lyon Opera and Hotel de Ville and adjacent to the metro station Hotel de Ville. Great for families with children.